Curvy Road provides the automotive connoisseur the opportunity to drive one or a number of exotics - when it’s convenient for them, without the costs and hassles of ownership, buying, selling or depreciation. Curvy Road Holdings, in its 15th year of offering time-shares of exotic automobiles to its members, has launched its Fort Myers/Naples location to provide more fractional ownership options to its South Florida market. With the move, Curvy Road is expanding its reach beyond Chicago, Los Angeles, and New York to cover an area with a growing market of high net worth and other individuals who appreciate fine automobiles from around the world, but who don’t want to get caught up in full ownership. Curvy Road founder and CEO George Kiebala has partnered with Mike Case, president of C.A.R.S., in establishing a new shared location. C.A.R.S., 17570 North Tamiami Trail, Unit 2, is a North Fort Myers auto enthusiasts dream providing services ranging from high-end restoration, to vehicle transport, to vehicle research and consulting in a facility that also includes a vintage automotive sign collection & exhibit. Curvy Road’s new location is minutes from Fort Myers International airport, and a quick drive to Naples, Sanibel Island, Bonita Springs, Marco Island, and the rest of South Florida. Offering a stable of high-end exotic automobiles for one-week-at-a-time usages via its Private Access Plan, Curvy Road provides the automotive connoisseur the opportunity to drive one or a number of exotics - when it’s convenient for them, said Kiebala, "without the costs and hassles of ownership, buying, selling or depreciation." Having just added a Lamborghini Gallardo Spyder LP 560-4, and a Bentley Continental GT V8 Twin Turbo coupe to the program, the Private Access Plan offers different vehicles for different tastes, and allows each member to experience as much or as little variety as they’d like, Kiebala said. The program also offers an Audi R8 R-tronic, a Ferrari 430 Spider, a Corvette Grand Sport Convertible, a Gallardo e-Gear coupe, a couple of classic Ferrari’s and numerous other world class automobiles. "It’s all the anticipation each time of getting a new exotic car delivered every few weeks, or every couple of months throughout the year, but without having to experience all the hassles associated with purchasing an expensive, rapidly depreciating vehicle," he said. "We pick up all the supplemental insurance, provide the vehicle with a full tank of fuel, and fully inspect and detail the cars. Our one hour vehicle orientation makes the experience a memorable and enjoyable one no matter what type of vehicle our members have chosen." Curvy Road was founded in 2000 by Kiebala, whose passion for sharing the experience of driving these great cars has driven him and his organization to grow to a membership nationally of over 1,200 members, now operating out of four hubs, all headquartered in Palatine (IL) in the northwest suburbs of Chicago. Private Access Plan members need to meet Curvy Road’s strict requirements, such as minimum age of 25 and possess a good driving record, among other requirements. The rewards are substantial, as there are virtually no other avenues to experience multiple exotic vehicles each year in a cost-efficient way, with little more to worry about than where to drive. Kiebala added that Curvy Road is actively recruiting owners of exotic cars, especially late model Lamborghinis, Ferraris, Aston Martins, and Audi R8’s, for its Royalty program. 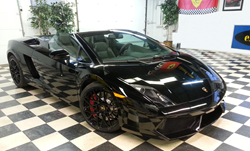 The program allows owners of late model exotics to time-share their vehicle through the Private Access Plan, thereby monetizing their vehicle while still retaining ownership. For more information, please visit http://www.MyExoticCar.com. Curvy Road http://www.curvyroad.com can be reached at (888) 358-7524, or via email at info(at)CurvyRoad(dot)com. Follow them on Facebook at Curvy Road, and on Twitter @CurvyRoad1.